The project took two weeks and the system was successfully implemented before the required implementation date of the first retailer. Customer Kellogg’s in Belgium is part of the global Kellogg Company, the world’s largest producer of breakfast cereals, the second largest producer of biscuits and savory snacks. 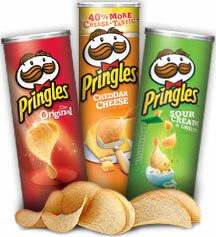 Challenge Converting the Pringles range of products from P&G to Kellogg's in the 1WorldSync data pool. Solution Use LANSA Data Sync Direct for downloading the P&G Pringles GTINs, transferring codes, GS1 synchronization and ongoing product information management (PIM). Key Benefits Meeting the implementation project deadline, plus ongoing data quality standards. Kellogg’s, officially named Kellogg Company, is the original and still the best maker of toasted cornflakes. Since its establishment in 1906, Kellogg’s has grown to become a global enterprise with over 32,000 employees worldwide. Today Kellogg’s is the world’s largest producer of breakfast cereals, the second largest producer of biscuits and crackers and – due to its acquisition of the iconic Pringles brand in May 2012 – the world’s second largest maker of savory snacks. The worldwide acquisition of Pringles, which was previously owned by Procter & Gamble (P&G), was especially important for Kellogg’s in Belgium, because Pringles’ European production facilities are located in Mechelen, Belgium. As a result of the acquisition, the Pringles product range had to be transferred from P&G to Kellogg’s in the 1WorldSync data pool. P&G uses a single Global Location Number (GLN), a code that uniquely identifies a GS1 member organization, for its entire product range. 1WorldSync could offer a GLN to GLN transfer, but it could not transfer only those products that belong to the Pringles brand. Kellogg’s then researched whether any of the GS1 partners could offer a solution that could identify and transfer the Pringles Global Trade Identification Numbers (GTINs) from P&G to Kellogg’s. The transfer would be for the full Pringles range of products including all packaging configurations, ranging from consumer units to wholesale pallets. All this had to be realized in a matter of weeks. Kellogg’s selected Data Sync Direct form LANSA, because of the product’s flexible and configurable setup and the company’s knowledgeable services team. Downloading the P&G Pringles GTINs from 1WorldSync. Storing the information in the Product Information Management (PIM) system of the Data Sync Direct product. Transferring codes and other fields and adding specific product attributes. Publishing the Kellogg’s Pringles GTINs to 1WorldSync. Testing and processing the first few Catalogue Item Confirmation (CIC) messages from retailers. Setting up automated workflow procedures for ongoing maintenance of product attributes. The Kellogg Company is an American multinational food manufacturing company headquartered in Battle Creek, Michigan, United States. Kellogg's produces cereal and convenience foods. The company's brands include Corn Flakes, Frosted Flakes, Rice Krispies, Special K, Cocoa Krispies, Keebler, Pringles, Pop-Tarts, Kashi, Cheez-It, Eggo, Nutri-Grain and many more.